Each exhibitor will receive a 10' x 10' pipe and drape booth, a 6' table with table covering, and two folding chairs. Electricity is available at a charge of $50.00/booth and has limited availability. See details below. 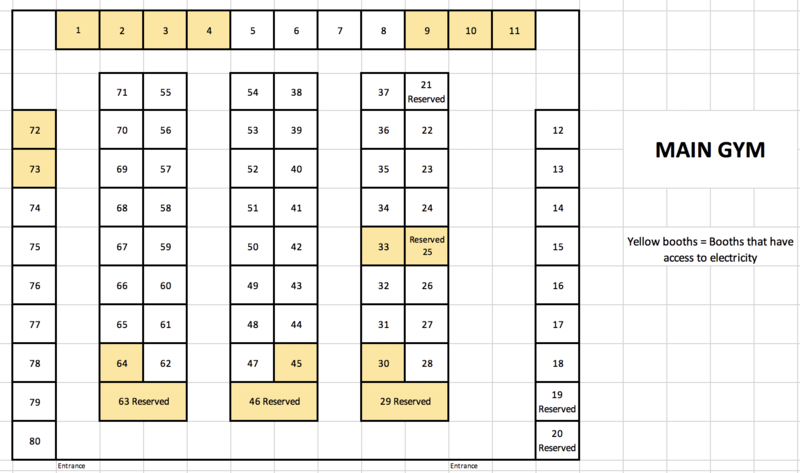 Please list your first three booth choices by number during registration. Reservations are made on a first-come, first-serve basis. 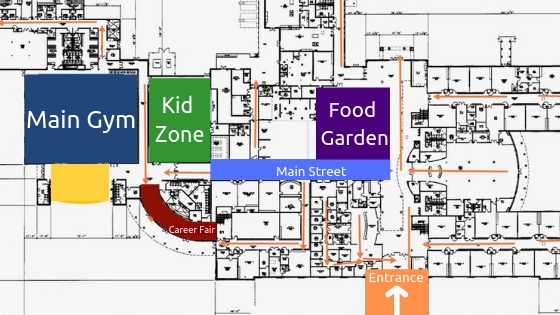 Businesses can choose placement in either the Main Gym, Kid Zone, or Main Street. Please note that Main Street booths are an additional $100 fee. If you would like electricity, please choose so during registration and double check that electricity is available for your booth numbers chosen. NEW: This year we will have a Business to Business Mixer on July 12th at 7pm. Come network and visit the booths. Main Street Booths (SOLD OUT): These booths will be positioned in the hallway leading into the gym from the main entrance, meaning that all attendees will have to walk right in front of you! This is a great opportunity for an additional $100 fee. 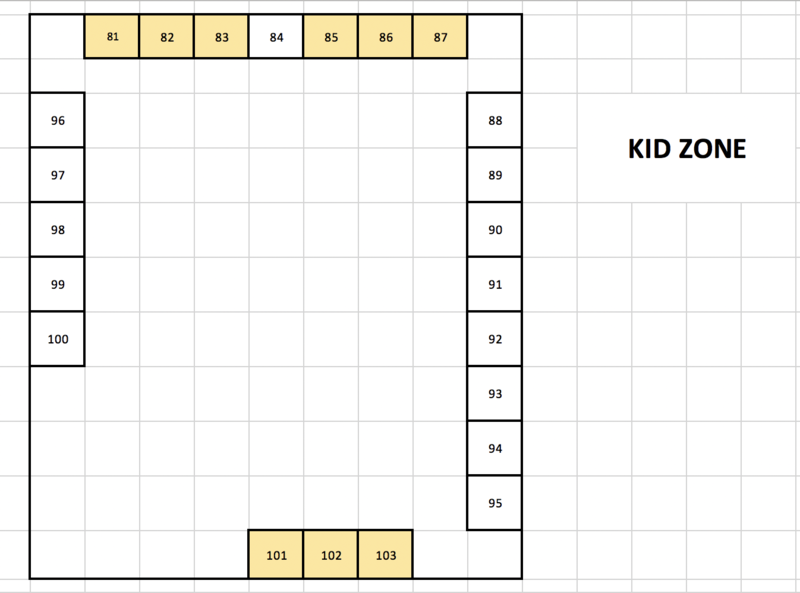 Kid Zone: These booths are ideal for businesses related to kids (ex. Speech Therapy, Schools, Dance studios, etc.). Mascots from the Nashville Professional Sports Teams, GNASH, T-RAC, and Booster, will make appearances in this section along with several other kid games/activities. 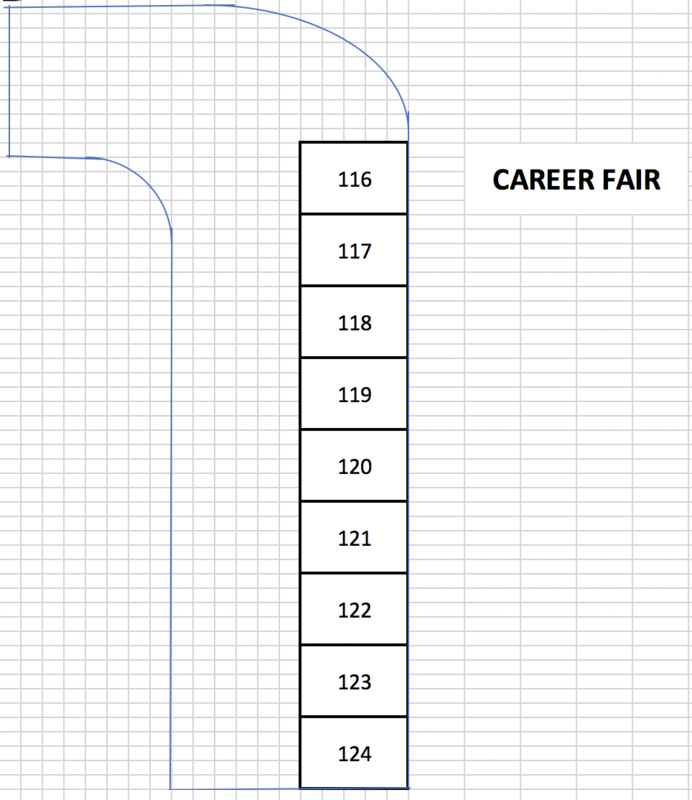 Career Fair: For $100, reserve a 6' table in the Career Fair center. Engage with people who are looking for employment. Private tables will be set-up in the back of the curve for one-on-one interviews. YELLOW BOOTHS: Booths that are marked yellow have electricity available for an additional $50. All booth reservations are first-come first-serve.